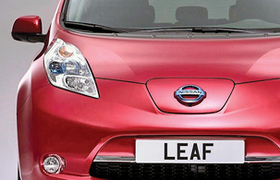 The Leaf currently averages 75 miles per charge. LOS ANGELES (Bloomberg) -- Nissan Motor Co., aiming to be the biggest mass-market seller of electric vehicles, said it will offer an option to U.S. owners of its Leaf hatchback to upgrade to the latest lithium-ion battery technology. Starting in the first half of 2014, Nissan will set up the program for customers to exchange battery packs, charging about $100 a month, the company said in an e-mailed statement. Currently, the automaker guarantees to replace or fix Leaf battery packs that fall below a certain performance level within the first five years of ownership, or 60,000 miles. "Technology is evolving and battery prices are projected to decline as EVs become increasingly mainstream," Erik Gottfried, Nissan's director of North American electric vehicle sales, said in the statement. The optional program "affords more flexibility for the future so that customers can both upgrade to the latest available technology for their Leaf and enjoy more predictable vehicle operating costs." The evolving battery vehicle market has forced carmakers to be flexible in how they sell their models. Honda Motor Co. recently cut the lease price for its electric Fit and Nissan repriced the Leaf model line for 2013, adding a modified lithium-ion pack that recharges faster and has improved range. Tesla Motors Inc., which led North American electric car sales in the first quarter, is building a U.S. network of supercharger devices to let customers recharge in about 30 minutes.